Hi, guys! Hope you’re all well! Here in NYC it has suddenly grown bitterly cold, so perhaps we can blame what you’re about to witness on the weather. I’ve been really interested lately in the fun cocoon coats and jackets popping up on Pinterest and fashion blogs. There’s something really daring about the exaggerated shape– I love it! I chose an amazing plaid wool coating from Mood in an attempt to mix a pretty traditional winter textile with a more modern style. 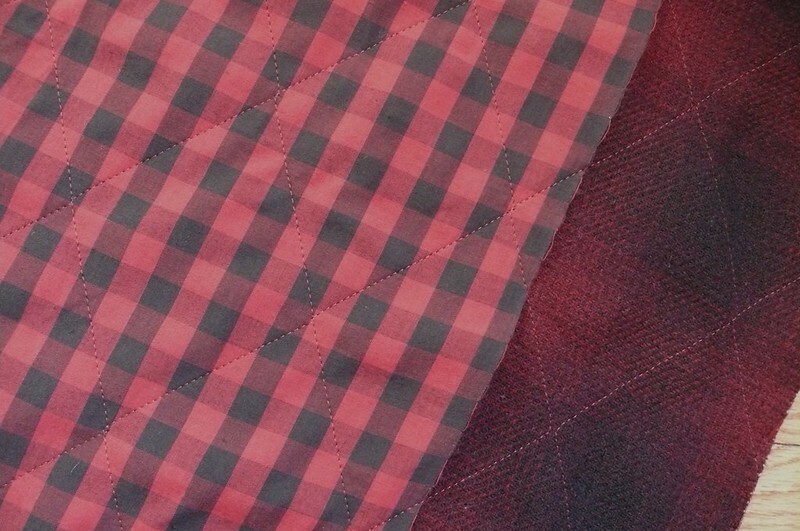 The really special thing about this fabric is that it’s already backed with a contrasting red gingham cotton, and both layers are quilted together. I’ve heard Carolyn urge her blog readers to take advantage of fabrics that come pre-lined since so much of the work is already done for you, and boy, she’s right (guys, she’s always right– I’m serious)! This was practically an insta-coat! The pattern is a new Burda download, Cocoon Cardigan 11/2013 #107. It’s so easy to put together that you don’t need the instructions (which is a good thing, because they aren’t very good). If you plan to make this, note that it’s very oversized– I cut my size, and, as you can see, it fits me very loosely. My plan was to bind the seams as I went along so the inside would be beautiful and clean, but that just seemed too bulky, so I opted to press the seams open and serge each half separately. This cardigan forms a sort of circle when it’s assembled, so the neckline and hems are finished all at once with a single hem band. I drafted a two-piece band instead of the suggested one-piece so I could cut the inner band with some buffalo check flannel I had leftover from my Banksia top. Wool can sometimes be a little scratchy right on my neck, but the flannel is sooooo soft and buttery! I also added my very favorite thing– flannel pockets! Seriously, try them in your next A/W garment– it’s such a treat for cold hands! I’m giving this a serious field test– it was 21F and really windy outside when we were taking these photos! Brrrr! Matching plaid that’s as large-scale as this was not a pleasant task– I think I spent three evenings after work puzzling out my cutting layout. The real problem was that I didn’t have enough fabric (a frequent problem when you buy fabric without having a plan for it). But I made it work as best I can, although it’s not perfect. Actually, I’m not sure there would be a perfect way to do it– the pattern is simple, but it has two-piece raglan sleeves, so I was trying to match at the front and back raglan seams, plus along the seams on the top and bottom of the sleeve. I nearly pitched a fit when I realized I couldn’t cut the final sleeve piece on the cross-grain after all (the plaid looks square, but isn’t quite, so it didn’t line up at all). When I calmed down, I figured out that I could cut the piece from two smaller pieces and seam them together. While this was annoying, you can’t really see the seam, so it worked out just fine. Alright, that’s enough construction talk– let’s get down to the nitty-gritty. Guys, I’m just not sure this style works on me or in this fabric! I’m about 50% in love with it, and 50% in hate. Somehow it’s sort of walking a line between Olsen Twin Chic and The Dude Abides. I’m thinking that it might help to shorten and narrow the sleeves– there’s something a bit overwhelming about this huge garment, so maybe it would be a bit more balanced if the sleeves weren’t so oversized. I also really like the curved hem, but I’m not crazy about how long it is in the back. But again, I’m really on the fence! What do you guys think– should I reduce the curve and shorten it a bit? I wasn’t totally sure how to style this, but I figured that I needed to be as streamlined as possible beneath the coat, so I whipped up a quick pair of leggings using Megan Nielsen’s Virginia leggings pattern and a cotton-Lycra jersey, also from Mood. Would you believe I’ve never sewn leggings before? Talk about instant gratification! I made these in about two hours, which is INSANELY fast for me, and included putting together the PDF. Now I want about 58 more pairs! If you’re looking for a leggings pattern, this one is no-fuss and ridiculously easy. 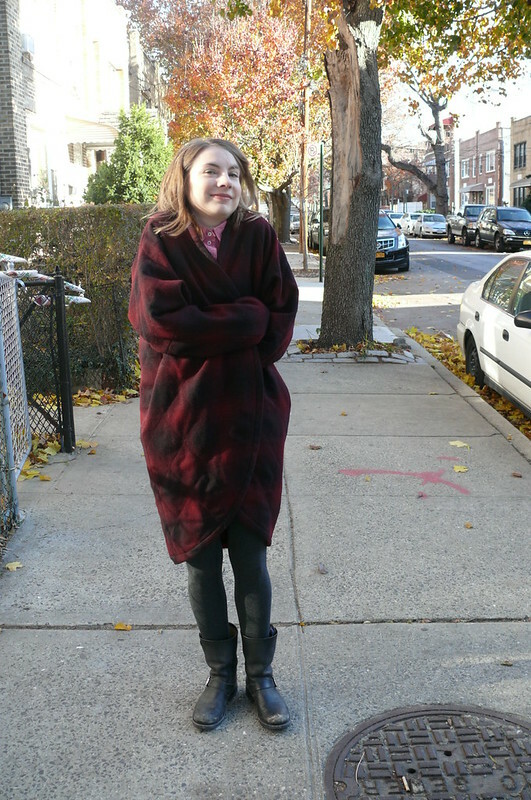 Alright, guys, what’s your honest opinion– do I look like I stole a blanket from a horse? What do you think of the cocoon coat trend? Do you have any suggestions for making this more wearable? Anyone else want to stay inside until May? Can we please go back inside now? « Patternmaking for Menswear Giveaway Winner! I love it on you as is! So cute. I’d be thrilled to have that very coat fitting like yours. I want to copy it. Make one! You would look super cool! 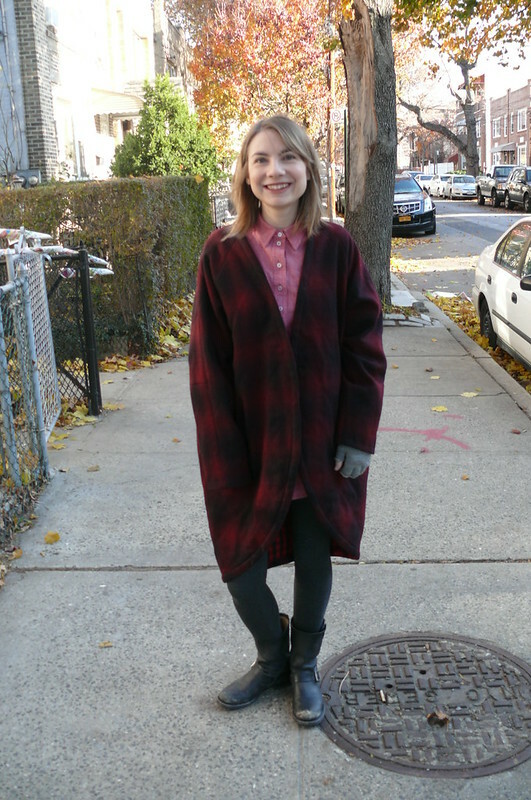 I had a very similar experience with a 1950s swing coat I made last winter. Different silhouette I know but one that is also supposed to be oversized like this. I did take out some of the fullness (altho that was at toile phase so a lot less bother) but kept in enough not to deviate from the whole point. It was still the biggest/ longest thing I had made myself and i felt drowned in at for a little while. Then this autumn/winter I totally got over it and have been loving it’s hugeness and living in it! Have you put it on I someone else of a similar size to you, I find I am always sooooo critical of my makes at first and on myself as I look at all the things I beat myself up about rather than the overall picture so seeing them on someone else can be really helpful! you so you can see what it looks like worn proportionally smaller?! Love the idea of it over all black with heels and a big sweeping black shawl/ scarf. I love the idea of wearing this over all black– sounds so chic! And I think you’re right– I want to slim it down a bit, under the arms mainly, but I don’t want to change the shape. Thanks so much for all the advice! I so love how you style everything, so I really appreciate your tips! Thanks, girl! It’s so very warm and just in time– it’s really cold and disgusting around here all of a sudden! Hi Sonia, I’m late to the party but I really love this on you! No, not Dude Abides…. I’m a sucker for big cocoon coats–I like feeling like I’m in a big ole blanket. And in this weather! They do mean you have to go volume-less everywhere else. What about shortening it above your knee? Or maybe you could trim down the side seams/sleeve seams and bring it more into proportion with your smaller frame. 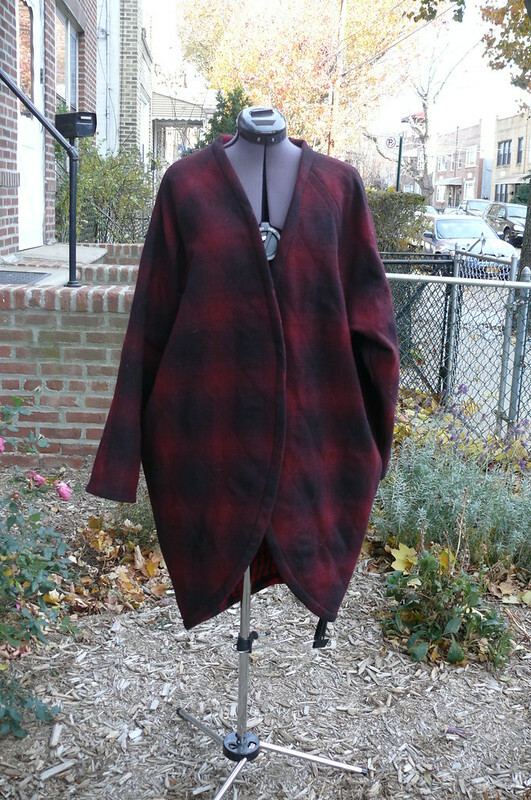 When I made a similar Burda coat, I went a size down because I was pretty sure I didn’t want to be swallowed alive! I absolutely LOVE LOVE LOVE this coat! It does NOT look like you stole a horse blanket! I was looking for a cocoon jacket/cardigan pattern and found the burda one you used. I have only sewn a burda pattern once before and I didn’t find it very easy at all (I’m a very very new sewer). So I’m scared to try this one. I am also allergic to wool and love fleece, so was wondering if you think a nice thick fleece would work for this pattern? Great job! Hey girl! Thank you so much! I think you could do this! The thing is, the instructions are TERRIBLE, but if you like, let me know when you’re ready to sew it and I can type up a better set of instructions. One thing I would warn is that it does run large (as you can see) so you might want to cut a size down or something. I think fleece would work well for this! Probably a more mid- to heavy-weight fleece so it could hold up the cocoon shape a bit. Hmmm, Burda uses that weird sizing, so I’m not sure what size that correlates to. Are you petite? I’m 5’6″ and you can see the length on me, so maybe you’ll want to shorten it? Oh yeah I definitely will then because I’m 5’3″. thanks for the help!! !